Holiday Shopping: Keep it local, Keep it Made in the USA, Keep it Made in Wisconsin! Yes, it’s that time of year again where all you see on TV and online are BLACK FRIDAY uber sales ads. We’re not here to tell you where to find the cheapest of anything. For us it’s more about supporting the up and comers or the folks who keep jobs in our fine state and contribute to growing our local economy. Trek’s only actually MADE IN AMERICA bikes are the most expensive Madones, TT bikes, and I think one Domane series. All the rest are manufactured in Taiwan and assembled here. There’s some cloud over people who still believe Trek is able to offer $500 bikes that are made in the USA. WRONG. No company could offer bikes for that cheap (yes, $500 for a bike is considered cheap nowadays, sorry to break it you!) . If they did, they’d go out of business almost immediately. $500 barely covers the cost of steel/aluminum tubing and that’s not even counting the components to get you riding. Schwinn/Pacific hasn’t been made in the US for YEARS. The days of Chicago made Schwinns are long dead and they were bought up by big box bike supplier Pacific, who also owns Cannondale. I don’t know if any Schwinn is made in the US anymore. Cannondale I think has a few that are. Moral of the story…research before you buy and before you scoff at the $1500-3000 price range of a custom made bike in the US, know that cost of labor in the US is much greater and the cost of steel/aluminum,titanium tubing as well as sourcing carbon and molding it is SUPER expensive. On to the point…there are a few companies base here that actually DO manufacture their goods right here in good old Wisco. We like to support them because they develop products, manufacture products, host customer service at their facilities, and are huge supporters of advocacy in our state. We won’t get into the complete history of the Waterford company, you can find that on their website. They were basically born out of the ashes of the original Schwinn company going bankrupt. Waterford makes custom steel frames for consumers and Gunnar is the brand they use for production style frames. The company had also been building bikes for Terry Bicycles, the all women’s brand, who later was bought out by another company so gone are the days of a good by women, for women USA designed and built bike. I’m sure Waterford could reproduce something similar to what Terry was asking of them. Waterford also builds the famous Rivendell frames. The guys at Riv give them the specs and Waterford crafts their sometimes strange, but beautiful designs. I personally dealt with Richard/Marc while planning for the Saris Gala and they are very generous people who have a great love for what they do and for supporting cycling culture here in Wisconsin. Oh how we love Scout Bags! Scout master Seth runs a small, but efficient operation. His web store features a selection of pre-made bag designs, but he’ll gladly work with you on getting something done up in customer colors. I had approached Seth/Scout Bags about getting something sent over for the Saris silent auction and ended up ordering a bag from him. He was so nice and he’s local (Wausau, WI), how could I not have?! I had my Timbuk 2 swig stolen out of my car last this past summer while out on a training ride and was feeling naked not having a good everyday bag to carry around misc. items. Once I gave my demands Seth quoted me a couple week lead time due to a few orders he was currently fulfilling, which ended up being perfect for me as I earned a commuter incentive that allowed me (Cassadra) to get some money towards the purchase of some commuter goods. The bag showed up at my office right around the time he had quoted me and I was blown away. The quality is excellent and the size of the bag (the Tomb model) was big enough to lug around a lot of gear, without being TOO huge for my girly frame. 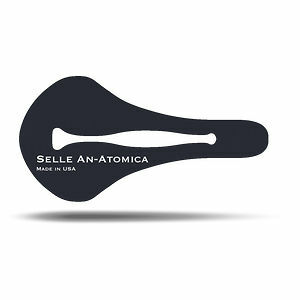 Selle An-Atomica has been churning out fine leathery goodness since 2007. They have a cult like following for people who were looking for something similar to a Brooks saddle, but with a cut out for the sensitive areas. The beautiful saddles are manufactured right here in good ol’ Wisconsin and are currently on holiday special for $99. For an amazing leather saddle, that’s quite the steal! That’s all she wrote for now. We’re always on the look out for more made in Wisconsin and Made in the USA products. Send us some of your favorites! ← These Ladies Know How to SHRED THE GNAR!